Of the many wildlife species in South Carolina, the bobcat (also called wildcat) is one of the more secretive and shy critters that live in our area. Bobcats are most active at night and are very territorial. 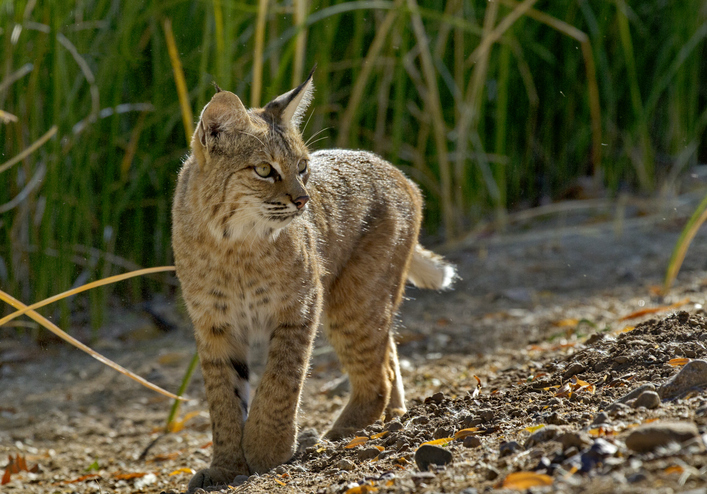 A bobcat will establish and keep the same territory for its entire life in most cases. When fully grown, at about 1.5 to 2 years of age, the bobcat is between two to three times the size of the average housecat. They are easy to recognize by their bobbed tail and white spots on the upper sides of the ears. Bobcats are very shy and will avoid people in most cases. The few instances when bobcats have attacked people, they were infected with rabies. Bobcats are present in all 48 contiguous states in the US and survive around 12 years in the wild. Bobcats do not form pair bonds and female bobcats raise kittens alone without the help of a male. If you encounter a bobcat, most of the time you can slowly back away and they will do the same. Other deterrents for bobcats are bright light and loud noise. If you own a home, there are things you can do to avoid attracting a bobcat to your yard. Don't leave pets outside unattended at night. Don't leave pet food, open trash or other items that might attract other wildlife as the bobcat preys on many other local wildlife species. Eliminating things that interest other types of wildlife can keep them and hungry bobcats away. And don't be fooled by fences. Bobcats can easily climb wooden fence posts and can even jump over fences as high as six feet tall. Bobcats are carnivores and will kill and eat almost any kind of animal from as small as a mouse to as large as an adult deer. Housecats, dogs, chickens kept in backyard coops and even livestock are considered good eats to a bobcat. Other frequent prey include rabbits, squirrels, opossum, raccoons, reptiles and wild turkeys. Bobcats are classified as "furbearers" and can be trapped or hunted in South Carolina on private lands with a hunting license during the appropriate season. Hunting season is Thanksgiving Day through March 1 and trapping season is December 1 through March 1. If you have a problem with a bobcat on your property, you can apply for a Nuisance Bobcat Depredation Permit in any season, which allows for the legal killing of a nuisance bobcat. Bobcats are not allowed to be relocated in South Carolina. Their territorial nature makes relocation ineffective as the bobcat will return to its established territory. The option many wildlife control services use to deal with nuisance bobcats is to trap and euthanize them. If you suspect you might have a nuisance bobcat on your property, a wildlife control specialist can investigate to confirm and can provide advice on deterring the animal from coming too close to your home. Deterrents can include motion lights, electric fencing or noise options. If deterrents don't solve the problem, a wildlife control service can humanely trap and deal with the animal. National Wildlife Day is September 4th! National Wildlife Day was founded in 2005 in honor of the memory of wildlife conservationist and activist, Steve Irwin. The goal of National Wildlife Day is to bring global awareness and provide education about the large number of endangered and threatened species both in our own areas and throughout the world, as well as the need for conservation and preservation programs. Many people are unsure of the difference between when a species is listed as endangered as opposed to threatened. The label "Endangered" is reserved for species that are in imminent danger of extinction in all or most of their natural range. The label "Threatened" is used for species that are likely to become endangered in all or most of their natural range in the foreseeable future. While species extinction is a natural process, the normal or "background" rate for species loss should be one to five species per year. Our current rate of species extinction is significantly higher, resulting in the loss of a dozen or more species per day. Scientists say the planet is now in its sixth wave of mass extinctions, the worst since the extinction of the dinosaurs. The list above is not complete as the number of threatened and endangered species is growing quickly. This September 4th, bring attention to the plight of our wildlife with the hashtag #NationalWildlifeDay and investigate conservation groups in your area to see how you can get involved. The black bear is one of the many animals that make up our local wildlife population. They can range in size from as small as 100 lbs. for females to over 500 lbs. for older well-fed males. Their average lifespan is around 18 years and there are an estimated 300-400 black bears that live in the coastal areas of South Carolina. They are great swimmers and climbers who are most active from June through August - their peak breeding season. As more and more housing developments take up land that was once bear habitat, close encounters with bears will continue to increase. 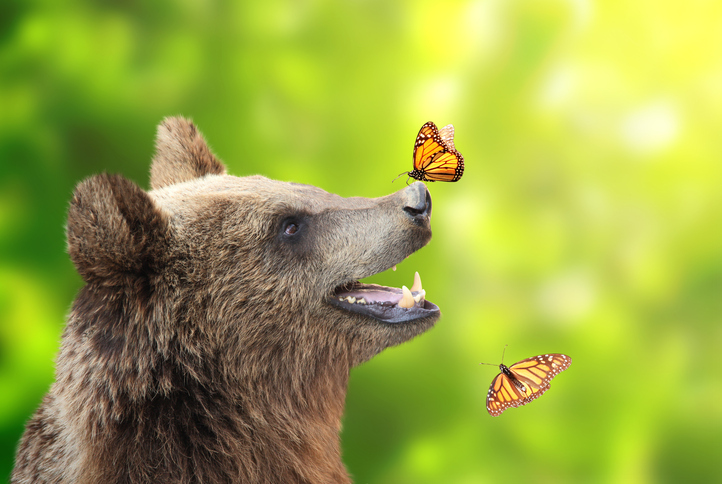 Bears eat mostly plants, berries and nuts (80% of their diet) and only eat a small amount of meat or insects (20%). However, like any wild animal, a bear will not ignore an easy meal left out and accessible by a careless human. In general, most black bears are shy and wary of humans. Unless someone has been feeding the bear or you happen to get between a mama bear and her cubs, most encounters resolve quickly and safely if you follow a few simple guidelines. 1. Never feed bears - intentionally or unintentionally. Bears will take advantage of any food source you leave accessible (or they think they smell - like your uncleaned grill). Keep trash secured, clean grills/outdoor cooking devices, pick up pet food at night and take down bird feeders at night. If a bear finds an easy meal at your house, the chances are higher he or she will return and end up becoming a nuisance bear. 2. Never approach baby bears. Even if you don't see mama bear, she's there and she's watching. If you do find yourself between a mama bear and her cubs, keep your eyes on mama (but don't make eye contact) and slowly back away until you can get into a house or other safe area. Allow the bear and her cubs to leave on their own before going outside again. 3. Do not climb a tree to escape a bear. They are excellent climbers and are better at it than most humans. 4. Do not make eye contact with a bear. However, you do want to keep an eye on the bear as you slowly back away. Stand up straight and make yourself appear as large as possible without acting in a threatening way as you are backing away. 5. Talk calmly and gently to the bear so it can identify you as human. Most bears are leery of humans and will be equally eager to get away from you too. 6. Never run from a bear if you can possibly avoid it. Like most wild animals, when you run away from them, it makes it more likely you'll be misidentified as food. 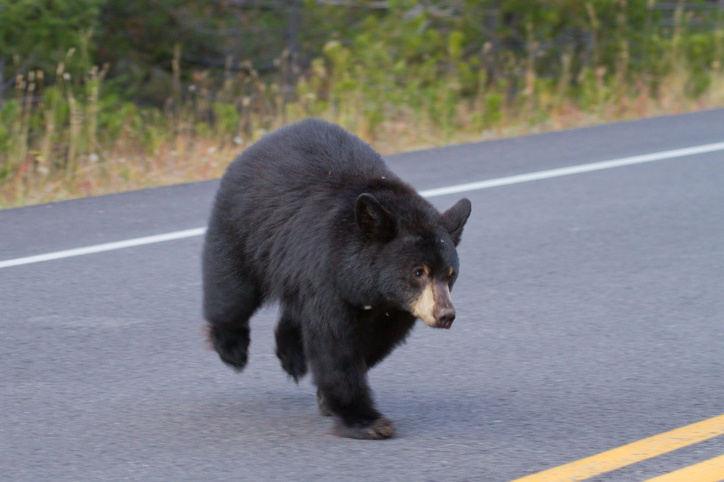 If you have any encounter with a bear, make sure the bear has completely moved on from the area before you go outdoors again to avoid an additional encounter. If you have any questions or have a bear on your property that is in no hurry to leave, call Pee Dee Wildlife for assistance. It's summertime and all of our snake friends are now awake for the season and on the go. While this quick guide of characteristics can help you differentiate between venomous and non-venomous snakes, please keep in mind to never intentionally approach a snake in an attempt to identify it. Always leave snake removal issues to the pros! Plus, even if a snake is not venomous, being bitten by any snake is an unpleasant experience. The shape of a snake's head can help you identify whether it is venomous or not. Venomous snakes tend to have a broad and triangular head. This shape occurs because the snake's venom is produced toward the back of the head near the neck. This makes it look as if the snake has a large, bulb-like head and a skinny neck. There are exceptions but generally, snakes with round pupils are non-venomous. Snakes with slit pupils, similar to a cat, are generally venomous. However, finding yourself close enough to a snake to determine what type of pupil it has is not a good situation. Back away slowly and retreat to a safe distance. Rattlesnakes get their name from the rattle on the end of their tail. ALL rattlesnakes are venomous and should be avoided. Some species of snakes have developed behaviors to mimic the rattling sound by swishing their tail through leaves or debris. Best course of action is if you hear rattling to move slowly in the opposite direction. Also keep in mind that baby rattlesnakes don't rattle as the rattle is created as the snake sheds its skin as it grows, but they are deadly should they bite. If you encounter a snake, remembering this quick guide list of differences between venomous and non-venomous snakes will help you determine how serious of a threat the snake is. In South Carolina, we have a number of venomous snakes including rattlesnakes, Cottonmouth (Water Moccasin), Copperhead and Coral Snakes. When it comes to snakes, don't take chances. Call the wildlife experts at Pee Dee Wildlife for safe removal and relocation. The heat is on and our local wildlife is on the move. Many animals viewed as pests are often discovered as roadkill this time of year. As our homes and developments take away more and more of their natural habitat, we encounter wildlife more often, especially on our roadways. Even animals many view as pests have important roles in our local ecosystems. For example, a single opossum can eat thousands and thousands of ticks throughout the summer and they're immune to Lyme - serving a very important role in protecting us from tick-borne illnesses. Additionally, some types of critters are suffering from declining populations due to being hit and killed by cars on our roadways. Turtles are a strong example of this issue. Turtle populations have been dropping steadily, in part due to roadway deaths. Local wildlife to watch for while driving include raccoons, geese, ducks, turtles, opossum, vultures, bobcats, deer, foxes, coyotes, rabbits, squirrels, frogs, snakes and bears. Avoiding animals on the road isn't just good for them, it's good for you as well. Even small animals can cause damage to your vehicle and costly repairs or even cause a loss of control resulting in an accident. And all animals have a role in our ecosystem and should be respected. 1. Be aware! - Distracted driving is a danger no matter where you are driving. If you're driving in wooded or wildlife-heavy areas, being aware can save an animal's life and yours too. Look for motion in roadside grasses or shrubs and watch for movement when driving in wooded areas for signs of wildlife near the roadway. 2. 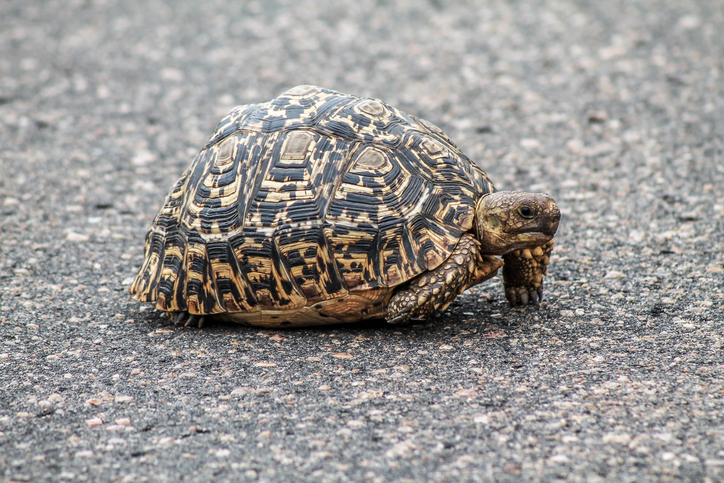 Stay calm and slow down/stop - If you do encounter an animal in the roadway, remain calm and slow down or stop, if needed. Don't honk your horn or flash your headlights at a wild animal as many will freeze when frightened and compound the problem. However, if you are stopped for an animal crossing the roadway, it is a good idea to turn your hazard lights or flashers on to alert other drivers to be cautious. 3. Also look for animals in the distance - Turtles, for example, can look like rocks from a distance. Keep an eye out for anything that looks different or unusual on your route, both up close and from a distance to notice animals on the road as soon as you can. 4. When you see one, expect more - Many animals travel in small groups or pairs. Deer for example, often travel in small groups so when you see one, expect there are others nearby, slow down, and be alert. Also, when you see an animal run across the roadway, keep in mind that animal might be running away from another animal (even a pet dog or cat). Many people avoid hitting the first animal but wind up hitting the second animal in these situations. Our local wildlife is diverse and each animal plays a role in our ecosystem. Unfortunately, as we build homes and roads and take over more of their habitat, we encounter them more frequently on our roadways. Being aware and knowing what to look for can go a long way in keeping you and our local wild animals safe.